Our caring dentists at Cornerstone Dental understand that tooth loss can affect the health, appearance, and function of your smile, as well as your self-confidence. We are pleased to provide dental implants to replace missing teeth and restore your smile to its full potential. A dental implant is a tooth replacement option that permanently replaces both the root and crown of the missing tooth. The implant process begins with the surgical implantation of the implant post into the jawbone, which can be performed by Dr. Goodwill if you are candidate for the in-office placement treatment. This replaces the missing tooth root and forms a strong foundation for the dental implant restoration. After a period of healing, Dr. Stacy Goodwill will place an attachment called an abutment on the post. The implant restoration is then fixed to the top of this to replace the crown of the tooth, or the part that is visible above the gums. Based on your personal dental needs, the implant restoration may be a dental crown, a bridge, or a complete or partial denture. Once completed, a dental implant can greatly enhance your smile. Because the implant replaces the entire tooth, it looks, feels, and functions just like your natural tooth. With proper dental care, your implant can last a lifetime. To learn more about dental implants and how they can benefit you, call Cornerstone Dental in Fargo, ND today at 701-237-3583 and schedule a consultation with one of the doctors. Dental implants support restorations that retain the feel, look, and function of natural teeth. Many consider them the best alternative to natural teeth. They are stable and strong, and allow patients the freedom to eat the foods they love without the worry of damage or accidental dislodging. When the doctor places a traditional dental bridge for one of our patients, she must place dental crowns over healthy teeth on either side of the gap created by the missing tooth or teeth. This requires the removal of part of the enamel layer on each tooth receiving a crown. Removing this small amount of structure from the tooth means that the patient will always need a crown covering it. An implant-supported dental bridge requires no crowns, eliminating the need to alter the structure of surrounding teeth. The bridge attaches directly to the implant, which provides a sturdy anchor for the replacement teeth. Our patients who wear traditional dentures tell us about difficulties they experience when eating and talking. Their dentures wobble and click when they talk or eat, and some even have issues with their dentures falling out of their mouth. Traditional dentures require patients to come in occasionally for re-lining. This happens because the denture loses its snug fit against the gums as the jawbone slowly shrinks. Since dental implants fuse securely with the bone of the jaw, they provide a strong, stable hold that keeps dentures from wobbling, clicking, or falling out. The fit of the patient’s denture remains secure because the jaw experiences no deterioration. Dental Crown – For a single dental crown, the patient will receive one implant. 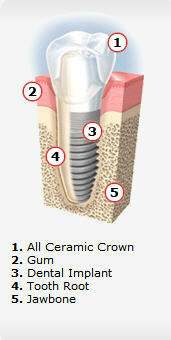 The doctors will use a strong but safe dental adhesive to permanently bond the crown to the implant. Dental Bridge – The doctors permanently attach implant-supported bridges to one or more dental implants. This provides a secure restoration, while eliminating the need to remove structure from healthy teeth. Partial or Complete Dentures – The most common type of implant-supported dentures, these removable dentures snap on and off of your dental implants with ease, allowing for easy cleaning of the dentures and the patient’s mouth. We invite you to call us and schedule your appointment on our Fargo dental office today, so you can learn more about the advantages of implant dentistry and to schedule your implant consultation. Call (701) 237-3583 today.